Established: The Doing Business project was launched in 2002 and the first report was published in 2003, covering 133 economies. The Doing Business Ranking is an annual ranking. Objective: to provide an objective basis for understanding and improving the regulatory environment for business around the world by gathering and analyzing comprehensive quantitative data to compare business regulation environments across economies and over time. 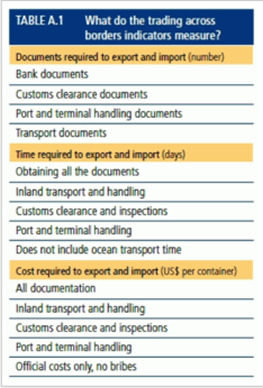 The time and cost for ocean transport are not included. Payment is made by letter of credit and time necessary for the processing of the letter of credit is included. Assumptions about the businesses participating in the survey: The business has at least 60 employees, is located in the economy's largest business city, is a private limited liability company that does not operation in an export processing zone or other area with special export and import regimes, is domestically owned with no foreign ownership, and exports more than 10% of its sales. Assumptions about the traded goods: The traded product travels in a dry-cargo, 20-foot, full container load. It weighs 10 tons and is valued at $20,000 and is not hazardous nor does it include military items, does not require refrigeration or any special environment, does not require SPS or environmental safety standards other than accepted international standards, and is one of the economy's leading export or import products.